I had the honor of being invited to a very special event in October, 2016. 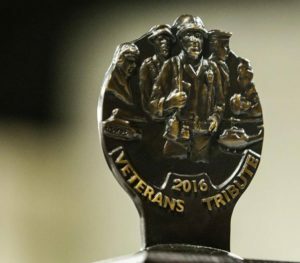 The event entitled, “Veterans Tribute 2016” brought together over 300 veterans including those from the Vietnam War, WWII and Korea. Over 800 folks attended in all. This was the first veteran special event I’ve attended since returning home from Vietnam in 1970 and it could not have been better. I saw old classmates and made new friends. We listened to many fine speakers, two of whom recently published books about their Vietnam War experiences. Each veteran had a collage displayed sequentially on 4 huge big-screens in front of the room, so we each had our few moments of recognition. Later, the MC called each one of us by name. As we stood to be recognized, a member of the Grizzly Academy brought us a beautiful Veterans Tribute 2016 plaque, a copy of our collage and 6 certificates of appreciation for our service, each signed by our various government representatives. 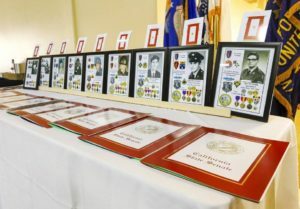 Finally, all of our fallen veterans were recognized up front with photographs and collages detailing their service to our country. It was very touching to say the least. The event lasted 4.5 hours, but it was so enjoyable it seemed like much less. At last, a Home Coming after all these years!